Do you want chocolate, or vanilla? Are you in the mood for a comedy, or some horror? Would you rather be happy, or powerful and filthy rich? The best option is to have half of both, wouldn't you agree? Good, then you'll both love and hate (but mostly love) wearing this wicked Split Personality Villain Costume for Halloween! If you're one of those people who has ever had to choose between two equally appealing options, you know how hard it can be. Statistically speaking, picking between just two things should be the easiest choice, since 50% of you is getting what it wants, but the flip side of the coin is that the other 50% is not. Math isn't everything, though, and in the real world, you can choose both sides at the same time, but the result may not always be too pretty. 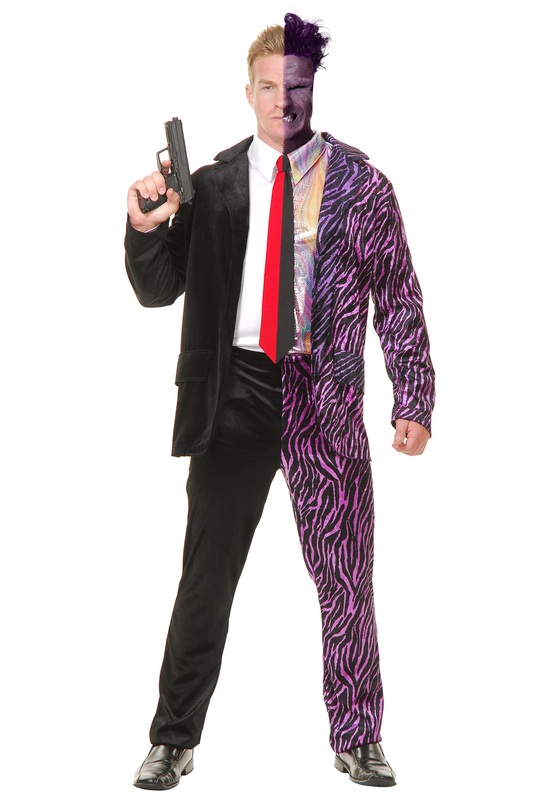 Choosing to be both a handsome, professional gangster, and a wild, unhinged madman at the same time, though, is the most stylish combo of choices that have ever been smashed together! This dashingly polarized costume gives you the look of a conflicted comic book criminal, who doesn't bother making decisions and just picks both options! One half of this ensemble is a standard business suit, prim and proper, perfect for a day at the office. The other half is fierce and extreme, perfect for a day of mayhem and villainy! Break out your costume makeup to create the face of your darker half before going on your split personality crime spree, because choosing between two things is for suckers!